Articles published before June 2017 have been archived. Please visit utep.edu/news. The Texas Higher Education Coordinating Board has approved a new Ph.D. program in mechanical engineering at The University of Texas at El Paso, bringing the total number of doctoral degrees offered by UTEP to 21. UTEP mechanical engineering Ph.D. candidates will receive a broad-based, integrated education, including design thinking for complex engineered systems, research training in a creative knowledge environment, and research training in a national laboratory or industry setting. The doctoral program will have an emphasis on energy, aerospace and advanced manufacturing, areas that have a strong record of success for the Department of Mechanical Engineering, which is part of UTEP’s College of Engineering. The Ph.D. joins a Bachelor of Science and a Master of Science in mechanical engineering, along with a graduate certificate in 3-D engineering and additive manufacturing. A professional Master of Science in aerospace and defense engineering is planned for 2017. Students may apply for the new Ph.D. program now and begin the course of study in fall 2016. Based on the department’s current student population – 81 percent of whom are Hispanic – the implementation of the degree should contribute to an increase in Hispanic enrollment in mechanical engineering doctoral programs in Texas. In 2012, only 24 of 549 total mechanical engineering doctoral students in Texas were Hispanic, and none of the 78 doctoral degrees awarded that year were to Hispanics, according to data from the American Society for Engineering Education. Part of that funding has come through the department’s NASA MIRO Center for Space Exploration Technology Research, or cSETR, whose facilities include the Goddard Propulsion Research Lab, Challenger-Columbia Structural and Materials Research Lab, and a computational lab. The center has received $10 million from NASA to develop the next generation of rocket engines using liquid methane. Another leading research initiative comes out of the mechanical engineering department’s W.M. 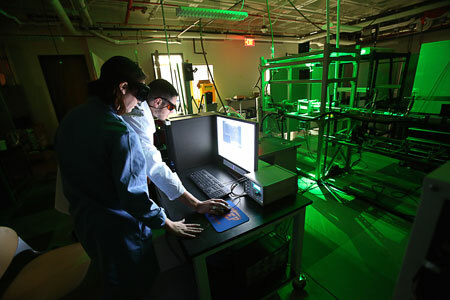 Keck Center for 3D Innovation, home to the first satellite center of America Makes, the National Additive Manufacturing Innovation Institute. The Keck Center is renowned worldwide as a leader in 3-D printing research and technology, employing dozens of UTEP students in its efforts. 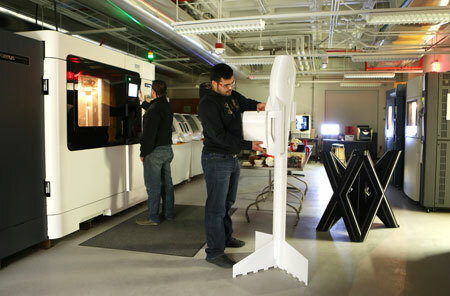 Currently, it is leading an America Makes member team comprised of the University of New Mexico, Youngstown State University, the Lockheed Martin Corp., Northrop Grumman Corp., rp+m Inc., and Stratasys Inc., on a $2.2 million grant award to further 3-D printing technologies for rapid manufacturing of aerospace systems. While conventional mechanical engineering doctoral programs aim to develop future educators, UTEP’s program will focus on training future technology leaders for industry, which will strengthen the innovation ecosystem for regional, state and national economic growth. Students in the program, trained in technology entrepreneurship and leadership, will partner with industry to create new jobs. Two current students in the University’s environmental science and engineering doctoral program are planning to take advantage of this new offering immediately. “I am excited about the new program because it will bring a great Ph.D. opportunity to the border,” said Luz Bugarin, who received both her bachelor’s and master’s degrees in mechanical engineering from UTEP and aims to work in the energy or aerospace industry once she has completed her education. Bugarin is grateful to the department for offering her access to a broad spectrum of engineering ranging from design, modeling, manufacturing and teaching to analytical and hands-on laboratory research. “This exposure, as well as the excellent mentorship available within the department, has inspired me to pursue higher education within the mechanical engineering field,” she said, adding that she is just about to complete a 19-week internship gaining hands-on experience from professionals at NASA Johnson Space Center – an opportunity afforded through the department and cSETR. Faculty leading these students include Ryan Wicker, Ph.D., director of the Keck Center, professor of mechanical engineering and editor of the peer-reviewed journal Additive Manufacturing; Evgeny Shafirovich, Ph.D., associate professor and associate editor of the International Journal of Energetic Materials and Chemical Propulsion who, for the past five years has led teams of UTEP students selected by NASA to conduct microgravity experiments at Johnson Space Center; and Choudhuri, who joins Shavirofich as an associate fellow of the American Institute of Aeronautics and Astronautics. Manuel Hernandez, who also received his bachelor’s and master’s degrees in mechanical engineering from UTEP, believes that obtaining this Ph.D. will continue the momentum toward his professional goals. He calls his academic experiences within the department “invaluable” thus far, thanks to the skills he developed while working as an instructor and during internships with the Department of Energy’s National Energy Technology Laboratory and NASA. Knowing full well that financial obstacles often derail even the brightest students, UTEP’s mechanical engineering department also awarded Hernandez a Graduate Assistance in Areas of National Need (GAANN) Fellowship and supported his participation at a variety of out-of-town conferences. UTEP mechanical engineering alumni have already proved their mettle to employers who value their contribution to their programs. Students come out of UTEP’s mechanical engineering program ready to go due to the department’s approach to education, where academic instruction is coupled with training in industry practices, including hazards analysis and quality assurance standards. Giving these students access to industry inspired spaces like the department’s Lockheed Martin Corporation Mechanical Engineering Lab empowers them with experience within an industry R&D environment from their very first year. And it pays off. Almost 90 percent of UTEP mechanical engineering master’s degree recipients in 2015 received jobs in the energy sector, from aerospace and defense contractors, or from NASA, the Department of Defense or other federal agencies. One hundred percent of students graduating from the energy science and engineering track of the University’s Environmental Science and Engineering Ph.D. program – which has been a popular option for mechanical engineering majors – received job placement upon receipt of their doctorate. Robert Meyerson, president of the privately funded aerospace and spaceflight company Blue Origin, noted that UTEP alumni contributed to the first liquid hydrogen engine designed, built and test fired in America by his organization. “UTEP research on rocket engines using these propellants is a great example of how cSETR is developing future capabilities and a workforce for our commercial space system development projects,” he said. Bugarin is excited to become part of that workforce. “I believe that the mechanical engineering department at UTEP has a great vision and drive that will help catapult students into competitive jobs,” she said.